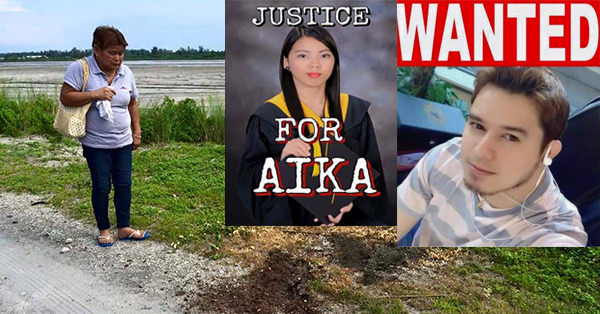 The hashtag #justiceforaika made rounds on Facebook on Sunday as netizens called for justice for the death of a woman named Aika Mojica. The 20-year-old victim was found dead with her shorts pulled down near the Maculcol bridge in San Felipe, Zambales. Mojica, a resident of Balic Balic, Barangay Sta. Rita, Olongapo, was reportedly shot thrice in the head and burnt. There were also signs that she was raped. A 17-year-old witness identified the suspects as Jonathan Dewayne Ciocon Viane a.k.a "Junat," said to be a US citizen residing in Barangay San Isidro in Subic, and a certain "Nino." According to Claire (not her real name), Junat allegedly got mad at the victim for telling his ex-wife, who is currently in the US, that he has been remiss in taking care of their 4-year-old child under his custody. However, Aika's father Joey asked the authorities to investigate deeper as he was not convinced that Claire is just a witness, the report said. A police operation to arrest the suspects is reportedly underway. Concerned netizens are helping in the hunt by sharing Junat's photos.